The Cape Fold mountains that rise out of the land like the quills of a porcupine on the Garden Route, unassailable for years by farmers who toiled on farms in the Klein Karoo, are riddled with routes, many of them forged by rivers along which wagons filled with produce battled the mountains to market. A route known as the 7 Passes explores many of these. Drive or cycle the beautiful old route; a road forged under the guidance of Thomas Bain. The 7 Passes Road once functioned as the major highway connecting George and Knysna, an old road that today is something of a country lane by comparison with the N2. What it offers is one of the most scenic and exciting drives of the Garden Route. The 75 km route crosses 10 rivers and seven gorges following the back roads, whilst scouring its way over the respective rivers after which the passes are named like the Swart, Hoogekraal, Homtini, Karatara, Silver, Kaaimans and Touw. It winds through dense bush, forest, past guest farms and little settlements, and over old-fashioned stone bridges. Also known as the Black River Pass, or Zwartrivierhoogte Pass, the old pass over the Black River was regarded as dangerous, though the modern version is uncomplicated enough to barely feel like a pass. 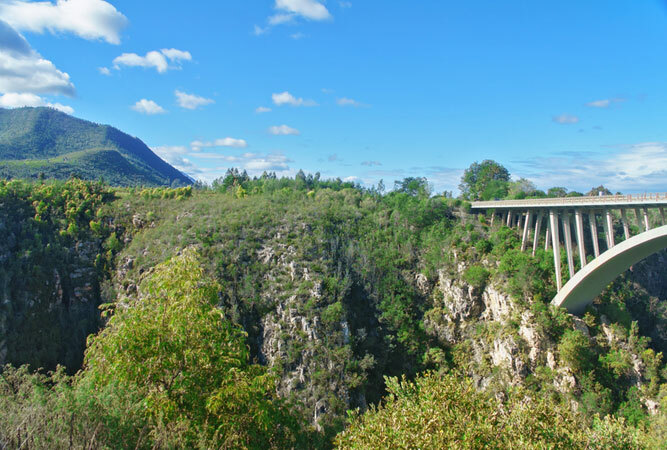 Its tar road is a smooth ride along easily navigable sweeping bends that run from George’s main road past the Garden Route Dam wall, across the Swart River and then up to the neck at Saasveld. Because this pass has changed so much from the original pass, it was not included in the historic Seven Passes route when it became a national monument. This stoic, narrow road, built by Adam de Smidt, is tar but is not in particularly good condition. Back when it was built, it was a difficult route for ox wagons. Its old bridge is worth mentioning. Originally a timber bridge with eight foot sides that resembled a wooden box, it was replaced in the early 1900s with a concrete bridge (as were many of the other bridges on the passes), and later declared a monument. This is a particularly short pass, starting where the Kaaimansgat Pass ends, and as such is often regarded merely as an extension of the former. The less than 3 km drive descends to and from the Silver River, most of it heading though dense, indigenous forest. It is a particularly scenic route. Another of Adam de Smidt’s passes, this easy-to-drive pass is a gravel road that remains exactly as it was when it was built, bar the update of the bridge from timber to steel. It is the fourth pass on the route and starts on the east side of the Touw River gorge, heading past various dairy farms, to end at the little village of Hoekwil. This pass is the first designed by Bain, if coming from George. 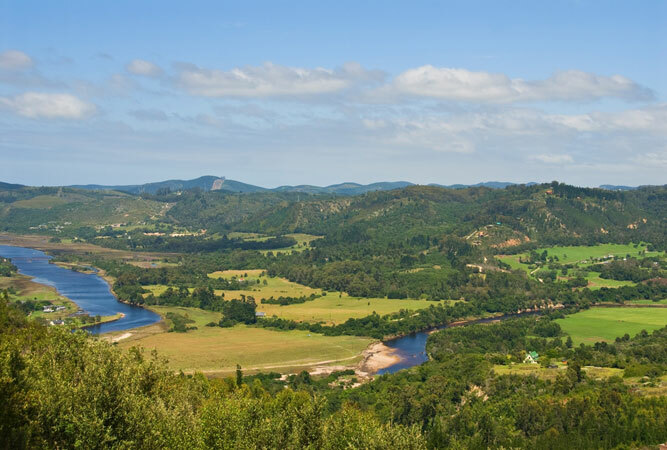 A short route, the just under 3 km of gravel road encompasses some of the best scenery on the route thus far and lies 10 km north of Sedgefield. Descending to and from the Hoogekraal River, the pass ends just west of Karatara. The bridge is a Victorian style bridge, similar to those at Kaaimansgat and Silver River. This gravel pass starts after Karatara village, just north of Sedgefield. A dispiriting story surrounds the village: woodcutters were based here in the aftermath of having their woodcutting permits revoked without warning by the government. Jobless and homeless, they were sent to Karatara, where their descendants remain. 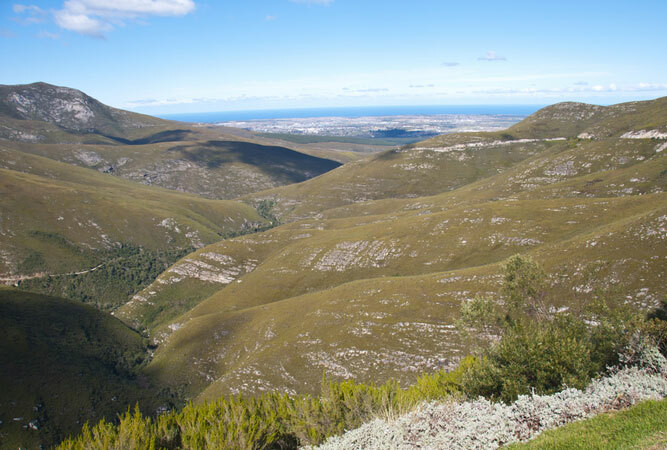 The pass over the Homtini River is also known as the Goukamma River Pass, which ends at Rheenendal Timber Mill. The gravel road is often flooded by the river, is corrugated and not always comfortable to drive, particularly the sharp bends. But the dramatic views are worth it. Named after the white phantom moth found in the area this 7.4 km pass heads down to the Knysna River Lagoon. 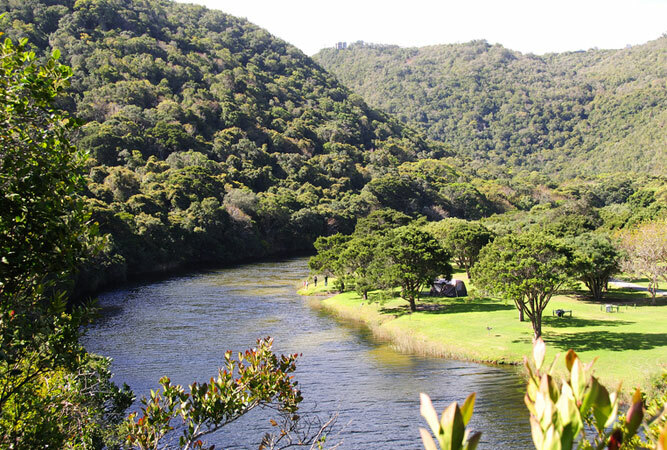 Thomas Charles John Bains’ work to link George with Knysna began with an access road to the Zuurvlakte Crown Forests for those who worked there, on the west end of the tidal Knysna River. This became known as the Phantom Pass. The 7 Passes route, between George and Knysna, served as the main road between the two towns for 70 years, until the N2 opened in 1952. Where to start: on the road that goes to the Saasveld Forest Station from George. Stops en route: Wilderness Heights, Woodville Big Tree (do the circular walk through the forest), numerous roadside shops, Millwood. To book a place to stay before, after or during your epic trip, see Garden Route accommodation or self-catering in Garden Route. 7 Passes starts and ends in tar, but the rest of the road is gravel, so you might want to check ahead if there have been heavy rains. Watch out for cyclists.